We can easily convert handwriting into digital format with touchscreen and suitable apps. But if you want to achieve it on a sheet of traditional paper, maybe Recorder, a magic pen with Bluetooth technology will help you in the near feature. Recorder is an innovative and practical design concept designed by seven designers, including Xia Xiaoqian, Renming Jun, Han Ricoeur and more. 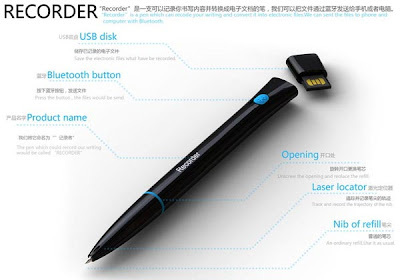 As we can see from the images, Recorder looks like a common pen, but don’t be cheated by the appearance, in fact, the concept pen features an integrated laser locater on its tip, which can be used to track your handwriting, and the built-in chip can record and convert the handwritten info on traditional paper into digital files. Moreover, the built-in Bluetooth technology allows you to conveniently connect the magic pen with your tablet or computer for transmission. Of course, you can also use the accompanying USB flash drive to transmit your files. Unfortunately, Recorder is still a design concept. We really expect the magic pen with Bluetooth technology will become reality.